Charles M. Merkel, III | Merkel & Cocke, P.A. Charles M. Merkel, III was born and raised in Clarksdale, MS. He attended the University of Mississippi for his undergraduate and law degrees, graduating with honors both times. While at Ole’ Miss as an undergraduate, he was awarded the Taylor Medal for English; this is the University’s highest academic honor, awarded to less than 1% of the student body. Upon graduation, he received the coveted position as a judicial law clerk for US District Court for the Southern District of Mississippi, Jackson Division. Mr. Merkel joined Merkel & Cocke, P.A. in 2002, where he works with clients who have sustained serious injuries because of negligence, medical malpractice and defective products. 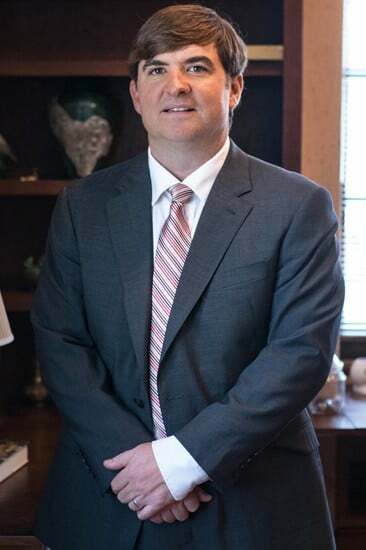 Mr. Merkel is on the board of North Mississippi Rural Legal Services, and a member of St. George’s Episcopal Church. He is an avid outdoorsman and hunter, and spends his free time with his family.